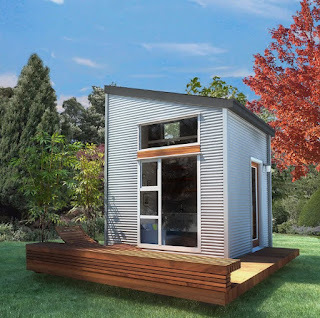 Simple, small modular and custom homes for the chemically sensitive. 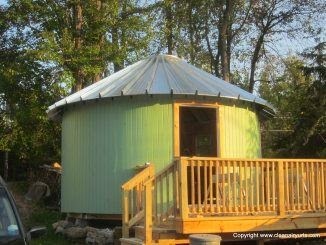 The metal yurt from Clean Air Yurts is 18 ft in diameter. The shell is made of galvanized steel coated in zinc. The door is metal as well. You would need to build a foundation and choose materials for the exterior and interior, provide insulation and wiring and plumbing (if desired). Though you could just leave it as a steel structure. 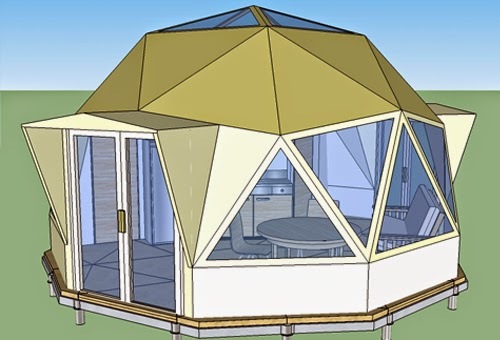 The yurt can be assembled in one day and can be taken down and moved if needed. 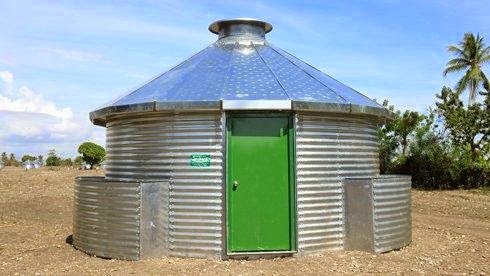 These Grain Bin Homes are also 18 ft in diameter and made of galvanized steel. There is room for a loft and it has louvers that can collect rain water if desired. Other options include solar panels. It does not come with options for interior/exterior or foundation, so those would be up to you. The homes are around 10K but there is a big discount for non-profits who are purchasing them. Eco Built Systems makes little domes. They used to be MgO based and now it looks like they are focused on glass domes and pyramids. This company has been a bit of a moving target for the last few years. They are being manufactured for distributors last I checked. From Out N' About, a company that rents out treehouses, sells plans and parts, this 16' Treezebo Hexagon could be a great non-toxic home. 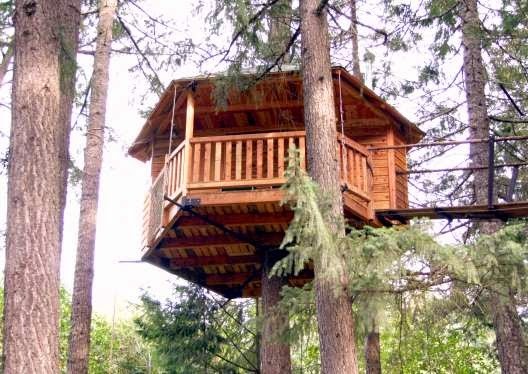 The plans for the treehouse are $450 and that includes a 3-hour consultation. The metal parts are $2000-2500 and the wood would come to around 5-10k, not including materials for wiring and plumbing. 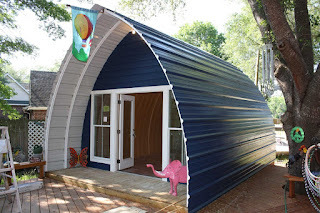 The basic kit for Arched Cabins includes kits include floor plates, ribs, ridge beam, standard R13 insulation, Super Span Roof Paneling, trim and fasteners needed to assemble the cabin. Arched Cabin kits not not include the foundation, installation, interior, end caps, delivery. The 12x12 kit is $2400. This is a simple, mostly metal kit that you could then customise to be chemical-free on the inside. 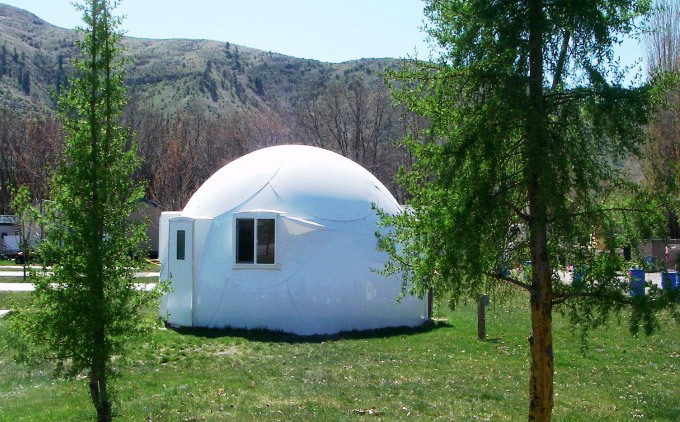 These cool domes are easy to transport and assemble and have a lifespan of 30 years. They are made of a fiberglass composite material which the company says does not emit an odour. Some sensitive people say fibreglass needs some time to offgas (1-2 years) and others find it ok fairly soon after production. The domes start at $7,500 for the 14' model in 2017. I've looked into these in detail so contact me for a consultation if you are interested in how to make these non-toxic and for more details and tips. These bare bone wooden cabins are made of solid wood. I see some OSB in the subfloor but that could be avoided. Opt for solid wood for the roofing as well. There is no insulation so they would be difficult to live in in extreme temperatures. It does not include roofing shingles and roof prepping, stains, railing, foundation and deck or windows. You do your own wiring, plumbing and systems as well. 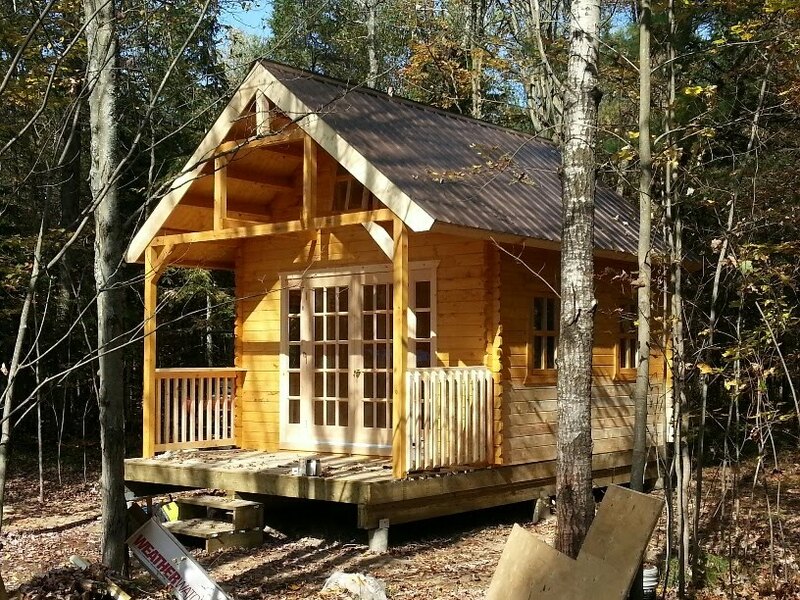 It is $6500 CAD for a 14 x 14 foot cabin. They are produced in Canada. The Nomad Micro is a 10x10 metal SIPs house. It can be made to be very non-toxic. They are 28K CAD (which is actually quite pricey). You need to add: shipping (From Vancouver BC, platform or slab, installation, wiring, heat, plumbing, hot water heater. There is an option to complete the inside in a non-toxic way. My most sensitive friend tested the SIPs and thought they were good. Nomad has stopped production of the 10 x 10 and only produces the 13x13 now. They have also changed the basic design of the units since I first posted on this. From Backyard Buildings in Maine, these tiny houses are a good deal. They are custom built. This one pictured is from a member of the EI groups on Facebook and I have her permission to post about it. The house is made of local wood, non-fiberglass insulation, low VOC adhesives, a woodstove (but you could use electric heat), wired for on grid (but can do off-grid as well), cedar siding, metal roof, and plumbing. They can be moved though they are not on wheels. 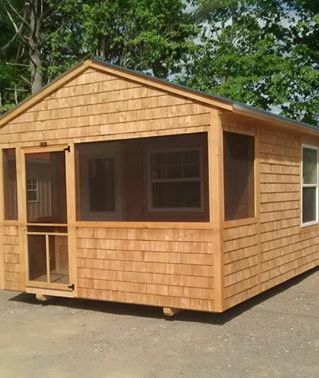 This one is 400 sq ft and was only 14K! 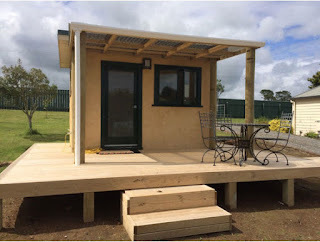 Hemp House Pods - a simple 8 x 12 structure meant to qualify as an ADU (without a permit) is made from hemp and a wood frame. Hemp may be mould proof in certain climates. 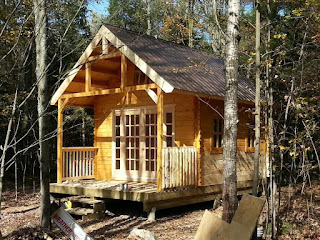 The cost does not include plumbing, electrical or the deck. The houses are 15K and they say they go up in a week. None of this content is paid, sponsored or affiliate linked. I imagine 18 inches should be 18 feet. Many interesting ideas here... thanks for posting! These are wonderful ideas. They may not be 100 percent problem-free for everyone, but it looks like tolerable substitutions can be mad on a number of then fairly simply. Thank you.